Editor's note: An earlier version of this story incorrectly referred to Nissan's Rich Miller as a grandfather. This update also clarifies one of his quotes near the end of the story to indicate that he was talking about the outgoing Titan. NASHVILLE -- Just two words sum up Nissan's strategy for relaunching into full-size pickups next month: sweet spot. Nissan knows it can't truly disrupt Ford, Chevrolet and Ram's near monopoly of the American big-pickup business. But by focusing on a small sweet spot in that market -- consumers who don't need the boulder-lugging power of a Ford F-250 or a Duramax-equipped Chevy Silverado -- Nissan's U.S. planners hope they can sell enough Titans to make a decent foothold. In round numbers? Maybe 100,000 a year ... eventually. The 2016 Titan is redesigned for the first time since it appeared in late 2003. It is big and powerful in its looks, but not too big. It is brawny in its ability to haul, but not too powerful. And it will be gentle in its ride over backcountry roads and ranch land -- but not too fussy. It is a "tweener" strategy, says Stephanie Brinley, who has been following Nissan's play as senior analyst for IHS Automotive. "There are people every year who buy light-duty pickups and wish they had gotten a bigger truck," Brinley says, "and people who buy medium-duty pickups and wish they had gotten something smaller. Nissan estimates there about 150,000 of those buyers a year. If they could capture half of them, they'll be doing great. "In this market," she adds, "failing to be the Ford F-150 isn't really a failure at all." 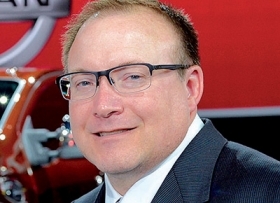 Rich Miller has been sharpening the point on Nissan's Titan plans for the past few years as the truck's chief product specialist. Miller says the Titan team has fussed over finding exactly the right balance of large-truck characteristics and components. Engineering teams have given out early versions of the truck during development to sheep ranchers in Idaho and horse-towing rodeo riders in Texas and asked them to drive them as as they normally would, in hopes of getting feedback. Nissan supplied development-stage Titans to the Jack Daniel's distillery in Lynchburg, Tenn., to get feedback on how well they hauled cargo beds of oak whiskey barrels. Those consumer experiences guided Nissan in deciding to use hydraulic cab mounts -- twice the diameter of normal hydraulic mounts -- to dampen road shock. They guided engineers on how to tune the tires to please potential drivers. They led to the development of a key fob that allows owners to make sure all their safety lights work while pulling a trailer. They clinched the decision to go with leaf springs instead of coil springs, mainly because "leafs are tried and true," Miller says, "and these customers told us the last thing they want when they're 70 miles from the closest service shop is for anything to go wrong." But Nissan's re-entry into the segment will all come down to towing, he says. "We want to serve that truck customer who needs enough power to haul a big payload -- but he doesn't really need to haul 10,000 pounds," Miller says. "And he doesn't want to pay for a truck that's bigger than what he needs. The sweet spot is really right there at about 6,000 pounds." Nissan has not released final pricing for the truck but has revealed its plan. The company wants to price the XD midway between a half-ton truck and the market's three-quarter-ton trucks. The bigger Detroit-brand competitors, such as the Chevrolet Silverado 2500HD and the Ford F-250 Super Duty, offer more muscle for towing and hauling. But Nissan believes there is an opportunity to entice marginal buyers with a slightly smaller truck priced a few thousand dollars below the market kings. The Titan XD version of the new family will reach showrooms next month, equipped with a 5.0-liter, V-8, turbocharged diesel engine supplied by Cummins Inc. It promises buyers 310 hp and 550 pounds-feet of torque. Other configurations will follow during 2016. A V-8, 5.6-liter, direct-injection gas engine XD will arrive in early 2016. Midyear, a structurally different version of the truck will roll out, called simply Titan. That version also will use a gasoline V-8 but ride on a different chassis from the XD, although its cab will be largely the same. 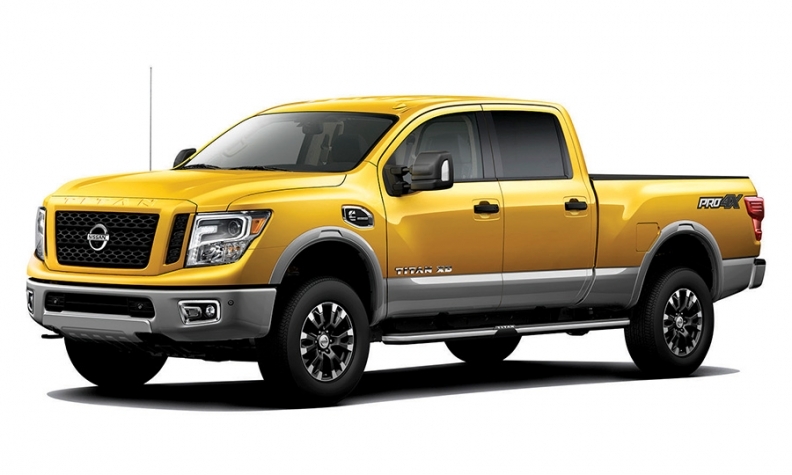 The Titan will be a traditional, standard-duty half-ton pickup, according to the company. There also will be a lower-cost single cab version intended to woo fleet buyers for the first time. There will be crew cabs and king cabs in the mix, and eventually a V-6 engine option. Miller, who has worked on the Titan since its first development in 1999, says Nissan recognizes it isn't going to displace the pickup market leaders. "The real market for us [in the outgoing Titan] is the owner who wants to carry two watercraft, or a 16-foot boat," Miller says. "That's about 3,500 pounds. We're not competing for the customer who wants to pull a 10-horse trailer. The other truckmakers are in that segment." The total pickup segment is up more than 10 percent for the year through October, to 2,080,370 sales, according to the Automotive News Data Center. Titan's closest competitor, the Toyota Tundra, sold nearly 100,000 vehicles through October, an increase of just under 1 percent from a year earlier. For the same period, the aging Titan tallied just 10,403 sales. Says Miller: "We're ready to go now."